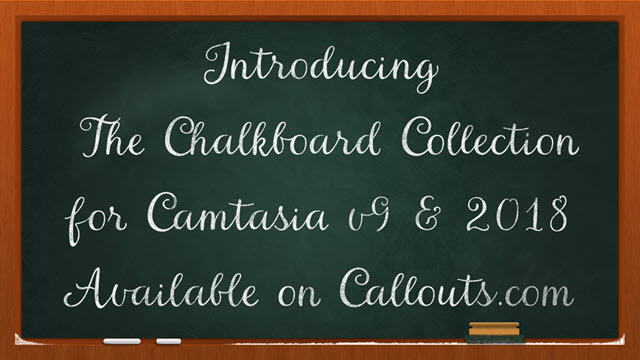 We are proud to present our latest template collection for Camtasia, The Chalkboard Collection! The template collection is optimized for Camtasia 9 and Camtasia 2018. It includes 2 green chalkboard backgrounds, two overlay files to create a chalk-like effect on any graphics or text placed under it, help file, font suggestions and more than 50 premade chalk texts. The templates are well organized and installs directly into the Camtasia library. Just install and drag-and-drop from the library to your Camtasia timeline. Place the chalkboard effect over your text, image or video for a chalklike effect. Check out the video below for an overview of included assets.